Personal, Social and Health Education, PSHE - is a subject taught as part of the National Curriculum in schools. The idea is to provide pupils with a grounding in those subjects which will become important in their teenage years and also when they leave school and enter the adult world. These have now been combined into an all-encompassing subject, now known as Personal, Social and Health Education (PSHE). What does Personal, Social and Health Education (PSHE) Involve? How are Personal, Social and Health Education (PSHE) taught? Personal, Social and Health Education (PSHE) is taught in a relaxed and informative manner with the class and the teacher sitting together in groups. The idea of the group format is to encourage all of those present to share some of their own life experiences and thoughts and feelings in an environment that is neither intimidating nor susceptible to misinterpretation. Visual aids are used as a means of opening the debate and the pupils are encouraged to comment freely on what they have seen or heard and how they think it will affect them. What are the aims of Personal, Social and Health Education (PSHE)? In addition it is hoped that by encouraging pupils to take part in Personal, Social and Health Education (PSHE) lessons that they will also learn how to communicate better, not only with each other, but with other adults around them. PSHE also aims to encourage positive social interaction as well as the breaking down of barriers between religions, nationalities and the social classes. 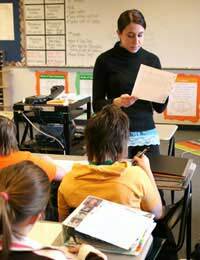 The introduction of Personal, Social and Health Education (PSHE) into the National Curriculum, even though it is not a markable subject, is seen as a direct response to our ever-changing society and those trends within it that have influence over our children's relationships and aspirations for the future.